This artist concept depicts the Space Launch System rocket rolling out of the Vehicle Assembly Building at NASA's Kennedy Space Center. SLS will be the most powerful rocket ever built and will launch the agency’s Orion spacecraft into a new era of exploration to destinations beyond low-Earth orbit. NASA has completed a major milestone on its journey to Mars and is ready to begin another phase of work on its spaceport of the future, where the next generation of astronauts will launch to Mars and other deep-space destinations. 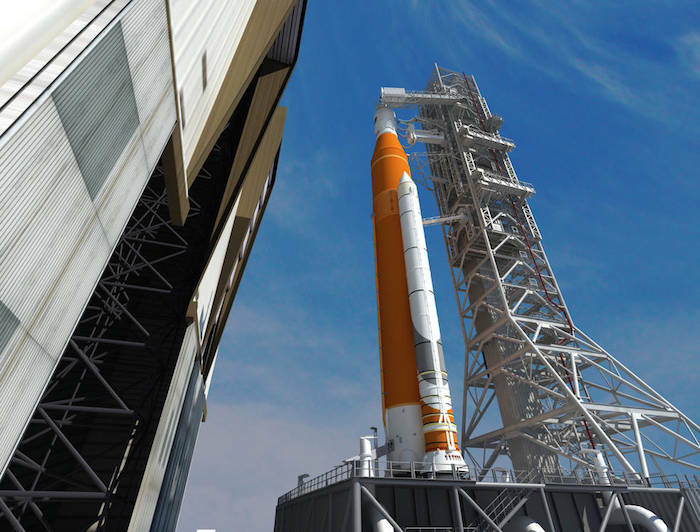 The agency recently wrapped up a comprehensive and successful review of plans for the facilities and ground support systems that will process the agency’s Space Launch System (SLS) rocket and Orion spacecraft at NASA’s Kennedy Space Center in Florida. Over the course of a few months, engineers and experts across the agency reviewed hundreds of documents as part of a comprehensive assessment. The Ground Systems Development and Operations Program (GSDO), responsible for processing SLS and Orion for flight and ensuring all systems and facilities are ready, completed its critical design review (CDR) of the facilities and ground support systems plans in December 2015. This was followed in January by the completion of an independent assessment by a Standing Review Board, a team of aerospace experts that assessed program readiness and confirmed the program is on track to complete the engineering design and development process on budget and on schedule. In the final step before actual fabrication, installation and testing of Kennedy's ground systems, the GSDO program and review board briefed the results of their assessments to NASA’s Agency Program Management Council, led by Associate Administrator Robert Lightfoot. Engineers are transforming Kennedy's launch infrastructure to support the SLS rocket and Orion spacecraft. The heavy-lift rocket will be stacked in the Vehicle Assembly Building on the mobile launcher and roll out to Launch Pad 39B atop a modified crawler transporter. The Orion spacecraft will be fueled with propellants in the Multi-Payload Processing Facility at Kennedy prior to stacking atop the rocket. The launch team will use the new command and control system in the firing room as the clock counts down to liftoff of SLS’s first flight. “The team is working hard and we are making remarkable progress transforming our facilities," said Mike Bolger, GSDO Program Manager. "As we are preparing for NASA's journey to Mars, the outstanding team at the Kennedy Space Center is ensuring that we will be ready to receive SLS and Orion flight hardware and process the vehicle for the first flight in 2018." The council also heard the results of the Orion CDR, completed at the program level in October 2015. The evaluation assessed the primary systems of the spacecraft, including the capsule’s structures, pyrotechnics, Launch Abort System jettison, guidance, navigation and control and software systems among many other elements. For the spacecraft’s first mission on the SLS rocket, ESA (European Space Agency) is providing Orion’s service module, which powers, propels, cools and provides consumables like air and water in space. Results from ESA's service module design review, which began this month, will be assessed and incorporated into Orion development and integration plans later this summer. Systems unique to the first crewed flight will be addressed at a review in the fall of 2017. Progress continues on Orion at NASA facilities across the country. The underlying structure of the crew module arrived at Kennedy in early February for outfitting, which is currently underway. Over the next 18 months, thousands of Orion components will arrive and be installed. Meanwhile, a structural representation of the service module is being tested at NASA’s Plum Brook Station in Sandusky, Ohio, where engineers conducted a successful solar array wing deployment test on Feb. 29 and are preparing for a variety of tests to confirm it can withstand the harsh conditions of launch.